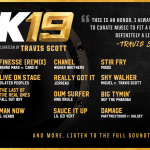 The NBA 2K19 Soundtrack has been revealed. This year’s playlist is curated by Travis Scott and features a wide selection of artists including Alison Wonderland, Ball Park Music, Fall Out Boy, Dilated Peoples, Shepta, and of course, Travis Scott himself. You can check out the full track listing below, as well as here in our Wiki. If you’d like to listen to the soundtrack before NBA 2K19 is released, it’s available on Spotify. 2K has also posted a video featuring Travis Scott talking to 20th Anniversary Edition cover player LeBron James about music and his history with the NBA 2K series. You can catch it below, or watch it here on YouTube. What are your thoughts on the NBA 2K19 Soundtrack? Have your say in the comments section below, and join in the discussion here in the NLSC Forum! As hinted at by the official NBA 2K Twitter account yesterday, we have our first gameplay trailer for NBA 2K19. Titled “Take the Crown”, it unsurprisingly prominently features its cover players LeBron James, Giannis Antetokounmpo, and Ben Simmons. It uses a song by Jay Rock, who will presumably feature on the game’s soundtrack. The trailer also features Team 2K members Jayson Tatum, Karl-Anthony Towns, Damian Lillard, Anthony Davis, D’Angelo Russell, and Kemba Walker. Other featured players include Kawhi Leonard and DeMar DeRozan in their new uniforms, John Wall, Kevin Durant, Stephen Curry, James Harden, and rookie Trae Young. As usual, all gameplay is from cinematic angles, and features a variety of highlight plays. Watch it below, or catch it here on the official NBA 2K YouTube channel. What are your thoughts on the trailer? Are you pumped for NBA 2K19? Have your say in the comments section below, and feel free to join in the discussion here in the NLSC Forum. Episode #258 of the NLSC Podcast is out now! We’re back on the air after taking an unexpected break last week, giving us a fortnight of news to discuss. Join Arcane and I as we chat about the recent developments in basketball gaming including female Create-a-Player in NBA Live 19, the first developer blog for NBA 2K19, and the big announcement regarding NBA 2K Playgrounds 2. EA Sports has announced the addition of Female Create-a-Player in NBA Live 19. It’s a cool addition to The One, though predictably, there have been some childish reactions to the news. While we still want to hear about the NBA side of things in NBA Live 19, a few other interesting tidbits have been revealed, including court customisation. A recent interview also acknowledged the possibility of NBA Live returning to the PC platform. The first NBA 2K19 developer blog delivered some great news about MyLEAGUE, MyGM, and MyLEAGUE Online. While we’ve been conditioned to take developer blogs with a grain of salt, it seems that a lot of great work has gone into the franchise experience this year. Looking back at last year’s preview season, we expect the flow of information to be steadier from here on out. We talk a little about some of the details we want to hear about. We now know that 2K Sports will be publishing NBA Playgrounds 2, now titled NBA 2K Playgrounds 2. It remains to be seen what it’ll mean for the game, and we do have some concerns. Also, we’d like to see EA bring NBA Jam back. Episode #258 of the NLSC Podcast wraps up with a quick chat about some recent NBA news, including Dwyane Wade’s future and new team branding. The first developer blog for NBA 2K19 has revealed details on MyLEAGUE, MyLEAGUE Online, and MyGM in this year’s game. Given the depth of NBA 2K’s franchise modes, it may seem difficult to imagine how they could get much better, but it appears that there will be some very nice enhancements in NBA 2K19. MyLEAGUE Online now reflects the offline experience, complete with full contracts (no more Keeper system) and comprehensive front office management. League admins have the ability to set the duration for completing offseason tasks, and participants have access to more information, such as who is currently online. Even more sliders have been added, allowing us to tune more aspects of MyLEAGUE. New sliders include various aspects of trade logic, salary expectations, and player progression. There is an incredible amount of customisation potential here, from teams and players to individual attributes. Create-a-Player has been enhanced, both for custom Draft Classes and CAPs in general. New face sculpting tools have been added, and created player templates can be shared via Player DNA. MyGM is now more flexible. In addition to a story-driven approach (“The Saga Continues”), we can now choose to play MyGM without a story. The traditional MyGM experience is also more flexible and customisable. The Draft has been enhanced with commentary and analysis. The new Draft Lottery system is also incorporated. Other additions and updates in terms of accuracy and depth include traded player exceptions, another year’s worth of draft picks to trade, new rule changes (and the ability to choose your own), user-chosen awards (overriding the sim engine’s picks), the new formats for the All-Star Game and Summer League, and additional tracking menus. A new Player Mentorship system will allow veteran players to have an impact on the development of younger players. There will be pre-created Draft Classes featuring historical players: 1960, 1965, 1969, 1970, 1974, and 1976-2017. These ready-made Classes can also be customised. That’s just a very brief overview, so be sure to check out the blog for the full scoop. Some screenshots of MyLEAGUE, MyLEAGUE Online, and MyGM were also posted in the blog. Check them out below, as well as in our NBA 2K19 Screenshots gallery. Brian Mazique of Forbes.com also had an opportunity to speak with Erick Boenisch about the improvements to all three franchise modes. Check out the video below, or here on YouTube. What are your thoughts on the first developer blog? Are you looking forward to playing these modes? Have your say in the comments section below, and join in the discussion here in the NLSC Forum. The latest First Look screenshots for NBA 2K19 reveal the final two members of Team 2K. Standard Edition cover player Giannis Antetokounmpo of the Milwaukee Bucks and D’Angelo Russell of the Brooklyn Nets are the featured players this time around. As with all of the other First Look screenshots, their initial Overall Ratings have been revealed. The Greek Freak will be rated 94 Overall, the same as in the final roster for NBA 2K18. Conversely, Russell has had a small jump, increasing from 82 to 83 Overall. 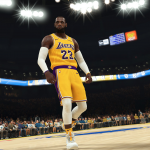 2K has also posted a high resolution screenshot of LeBron James in the newly unveiled Los Angeles Lakers uniform. Check out all of the latest screenshots below, as well as here in our NBA 2K19 Screenshots gallery. Another D’Angelo Russell screenshot with updated tattoos is apparently also forthcoming. The preview season is about to kick into high gear, as Operation Sports will have some developer blogs on MyLEAGUE, MyGM, MyLEAGUE Online, and more later in the week. Stay tuned for more information, and in the meantime, feel free to add your thoughts in the comments below, as well as join in the discussion here in the NLSC Forum. The official NBA 2K Twitter account has released another NBA 2K19 First Look screenshot, this time featuring Damian Lillard. The man they call Dame previously appeared on the cover of NBA Live 15, but has since become a member of Team 2K, voicing himself in various cutscenes in NBA 2K18’s MyCAREER mode. 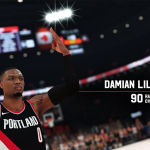 As with the other First Look screenshots, Lillard’s Overall Rating in the initial NBA 2K19 roster has been revealed. We now know that Lillard will be rated 90, matching the Overall Rating he had in the final official roster update for NBA 2K18, where he was one of fourteen active players to be rated 90 or more. Check out the full screenshot below, as well as here in our NBA 2K19 gallery. Got any thoughts on how the game is looking, or the Overall Ratings that have been revealed? Have your say in the comments section below, as well as join in the discussion here in the NLSC Forum. Three more NBA 2K19 First Look screenshots have been released. This time, the featured players are Team 2K members Anthony Davis, Paul George, and Kemba Walker. Davis and George are of course former NBA 2K cover players, appearing on the covers of NBA 2K16 and NBA 2K17 respectively. 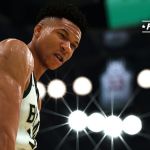 As is the case with the other First Look screenshots so far, their initial Overall Ratings in NBA 2K19 have been revealed. 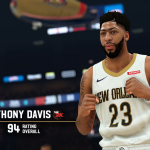 Anthony Davis will be rated 94 Overall, as he was in the final official roster for NBA 2K18, while Paul George’s Overall has increased from 88 to 89. Kemba Walker has also increased from an 85 to 86 Overall. While we’re still waiting for the usual preview season fare such as a full gameplay trailer, developer insights, and so forth, an interesting discovery was made over at Operation Sports. It seems the controls for NBA 2K19 have already been published on Xbox Live’s online help site, providing us with an overview of what to expect on the sticks. They are mostly similar to NBA 2K18, however there are some new stealing and shot contest controls. Check out the screenshots below, as well as in our gallery. Feel free to add your thoughts in the comments below, as well as join in the discussion in the NBA 2K19 section of the NLSC Forum. Episode #257 of the NLSC Podcast is out now! Arcane and I are back on the air this week after the combination of travel and a lack of news derailed our plans to record last Sunday. This week has given us plenty to talk about though, including an NBA Live 19 trailer, NBA 2K19 screenshots and hands-on impressions, and a few other news stories. A new NBA Live 19 trailer spotlighting the authentic courts from around the globe has been released. It’s given us a further glimpse of the gameplay and confirmed Allen Iverson as a member of the NBA Live Squad, but we would like some more NBA-oriented previews. What improvements would we like to see in terms of Franchise Mode and roster editing in NBA Live 19? Various NBA 2K19 First Look screenshots have dropped throughout the week. If nothing else, we know some Overall Ratings! Game Informer has provided us with a breakdown of eight significant gameplay improvements in NBA 2K19. They sound good, but we have heard some of it before. Charles Barkley has reiterated his stance on appearing in NBA 2K, leaving us to wonder why Take Two still isn’t taking him up on his offer. We wrap up Episode #257 of the NLSC Podcast with some NBA talk. Topics include free agency, trades, rumours, and how to adopt a new team as your favourite. A new NBA 2K19 screenshot has surfaced, revealing the next member of Team 2K. That player is DeMarcus Cousins, who recently signed with the defending champion Golden State Warriors. Cousins’ initial Overall Rating will be 90, which is identical to his rating in the final NBA 2K18 roster. Game Informer have also posted an article detailing eight improvements to gameplay in NBA 2K19. There will be a new Takeover system that allows players who are in rhythm to gain boosts to Badges specific to their Archetype, including additional animations. Clipping has reportedly been reduced, and a new steal system has been implemented. Enhancements have been made to the AI, one-on-one situations (on both sides of the ball), interior defense, and AI. Additional streetball moves have also been added, and are exclusive to The Playground. The Shot Meter also returns for layups this year, and we’ll have a choice between the old NBA 2K17 meter and the new one. Shot feedback has also been reworked for greater accuracy. Be sure to read the full article from Game Informer for more details. 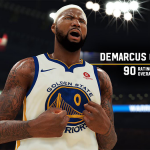 You can check out the DeMarcus Cousins screenshot below, as well as in our gallery. What are your thoughts on the reported gameplay improvements and the latest screenshot? Have your say in the comments section below, and join in the discussion in our NBA 2K19 Forum. The release of NBA 2K19 First Look screenshots featuring Team 2K members continues. The latest player to be spotlighted is 2016 Rookie of the Year and 2018 All-Star Karl-Anthony Towns of the Minnesota Timberwolves. 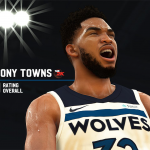 As they’ve been doing with the previous First Look screenshots, 2K also revealed Towns’ initial Overall Rating in this year’s game. He will be rated 91 Overall in the default roster, a modest jump from 90 Overall in the final roster for NBA 2K18. Other 90+ Overall players so far include LeBron James (98) and Kawhi Leonard (95). Check out the screenshot of Karl-Anthony Towns below, as well as here in our NBA 2K19 screenshots gallery. As always, feel free to add any thoughts you have in the comments section below, as well as join in all of the screenshot discussion taking place in this topic in the NLSC Forum. The latest NBA 2K19 First Look screenshot has revealed the next member of Team 2K: Australian cover player and 2018 Rookie of the Year, Ben Simmons. 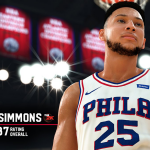 As with the other First Look screenshots, Simmons’ Overall Rating has also been revealed. He will be an 87 Overall in the default roster, which places him on par with fellow standout Class of 2018 rookies Jayson Tatum and Donovan Mitchell. His 87 Overall rating is also up from the 85 he had achieved by the final official roster for NBA 2K18. Check out the screenshot below, as well as here in our NBA 2K19 gallery. As always, feel free to leave your thoughts in the comments section below, as well as join in the discussion taking place in this topic in the NLSC Forum. Not one, not two, but three new NBA 2K19 First Look screenshots were released today. 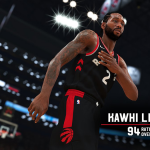 Reigning Slam Dunk Champion Donovan Mitchell of the Utah Jazz was revealed as the next member of Team 2K, while Kawhi Leonard and DeMar DeRozan – who have just been traded for each other – are also previewed wearing their new uniforms. As with the previous screenshots, the initial Overall Ratings for the three players have also been revealed. Kawhi Leonard is rated 94 Overall, DeMar DeRozan 89 Overall, and Donovan Mitchell 87 Overall. For comparison, they were rated 95 Overall, 89 Overall, and 84 Overall respectively in the final official rosters for NBA 2K18. Check out the screenshots below, as well as here in our NBA 2K19 gallery. What are your thoughts on the latest screenshots and Overall Ratings? Have your say in the comments section below, and join in the discussion here in the NLSC Forum. It seems that 2K Sports will be releasing First Look screenshots for NBA 2K19 throughout the week, featuring members of Team 2K. The latest screenshot features Jayson Tatum, who had a standout rookie season with the Boston Celtics in 2018. As with the previous screenshot featuring 20th Anniversary Edition cover player LeBron James, the latest screen also reveals Jayson Tatum’s Overall Rating. 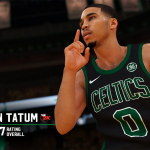 It seems Tatum will be rated 87 Overall in the default roster of NBA 2K19, up from the 82 Overall he was rated in the final official roster for NBA 2K18. Check out the full screenshot below. As always, feel free to leave your thoughts in the comments section, as well as join in the official screenshot discussion taking place here in the NLSC Forum. Once again, it looks like we’ll be getting screenshots of the Team 2K members throughout the week, so stay tuned for more previews of prominent players and their initial Overall Ratings! 2K Sports have revealed the second official NBA 2K19 screenshot via the game’s official Twitter. After providing us with a glimpse of Standard Edition cover player Giannis Antetokounmpo in the first official screenshot, the latest screen features LeBron James, cover player for the 20th Anniversary Edition. 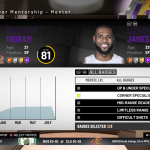 In addition to showing LeBron in his new Los Angeles Lakers garb, the screenshot also reveals him as a member of Team 2K, and his Overall Rating of 98. This would assuredly make him the highest rated active player in NBA 2K19. 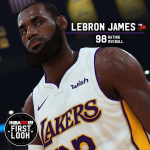 In NBA 2K18, the All-Time Cavaliers and All-Time Heat versions of LeBron were rated 99 Overall, while the active version on the Cavs was rated 97. Check out the screenshot of LeBron James below, and feel free to leave a comment with your thoughts on how the game is looking so far. You can also join in the discussion of all the official screenshots in this topic in the NLSC Forum. PlayStation Australia has revealed that 2018 Rookie of the Year and former number one overall draft pick Ben Simmons will appear on the Australian cover of NBA 2K19. This marks the first time that Australia has received a regional NBA 2K cover. As reported by Operation Sports’ Steve Noah, the cover will be available in both Australia and New Zealand. Furthermore, it will apparently be double-sided, with Ben Simmons on one side and Standard Edition cover player Giannis Antetokounmpo on the other. The cover art is very similar to the Standard Edition and 20th Anniversary Edition, featuring slogans associated with Simmons and his journey to the NBA. 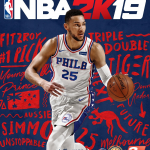 As a Novocastrian, I was disappointed to see that there aren’t any references to his time in the city where he played rep basketball (and where his father played professionally in our NBL), but it’s still great to see him on the first Aussie NBA 2K cover. Ben Simmons is the second Philadelphia 76ers player to appear on an NBA 2K cover, with Hall of Famer and original 2K cover player Allen Iverson being the first. Teammate Joel Embiid was confirmed as the cover player for NBA Live 19 last week. Check out the full cover art below. As always, feel free to share your thoughts in the comments section, as well as join in the discussion taking place in our NBA 2K19 Forum.